a series of forthcoming technical tools. These resources build on Conflict Dynamics’ previous work in this area which includes the publication of Bridging the Accountability Gap: New Approaches to Addressing Violations against Children in Armed Conflict  and Strengthening Protection of Children Through Accountability: The role of the UN Security Council in holding to account persistent violators of children’s rights and protections in situations of armed conflict . The Children in Armed Conflict Accountability Initiative is funded in part by the German Federal Foreign Office. Conflict Dynamics International is an independent, not for profit organization founded to prevent and resolve violent conflict between and within states, and to alleviate human suffering resulting from conflicts and other crises around the world. Since its establishment, Conflict Dynamics has focused on developing new approaches to strengthen the protection of children affected by armed conflict and this issue remains a core element of the organization’s New Frontiers in Humanitarian Policy Program. For more information on Conflict Dynamics’ mission and programs, please visit our website. For inquiries into the CAC Accountability Initiative or other programs of work, contact us at info@cacaccountability.org. 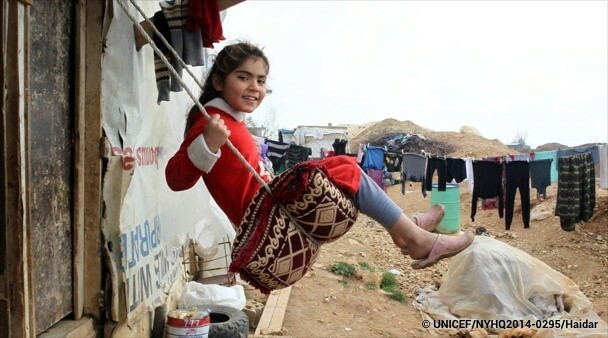 Photo caption: LEBANON, 2014: A girl plays on a swing, in the Faida informal tented settlement for Syrian refugees, in the Bekaa Valley.On 14 March 2014 in Lebanon, UNICEF Executive Director Anthony Lake – together with Chief Executive of Save the Children UK Justin Forsyth, United Nations High Commissioner for Refugees António Guterres, Mercy Corps Vice President of Global Engagement and Policy Andrea Koppel and World Vision International’s Regional Leader for the Middle East and Eastern Europe Conny Lenneberg – made a joint visit to the Bekaa Valley. The five organizations are united in calling for an immediate end to the fighting in the Syrian Arab Republic, where the continuing humanitarian crisis has forced more than 2.5 million people to flee to nearby countries. Lebanon is currently hosting over 491,700 of those refugees. The conflict – which enters its fourth year on 15 March – has also displaced more than 6 million people, one third of them children, inside the Syrian Arab Republic.